Lovina Beach with unspoiled black sand is a very unique beach. The most interesting part is the trip out to Lovina sea. You can see dolphins in the waters of Lovina that is located about 1 kilometer from the beach. Bali sea in Lovina is relatively calm so you can sail using just fishing boats. 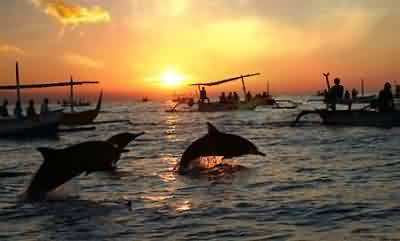 Lovina is famous as the place to witness the performances of wild dolphins. You can immediately see the funny behavior and friendly dolphins live in the middle of the sea. Of course this will be an interesting experience for your vacation. And for the record, there are hundreds of dolphins in Lovina. To be able to see the attraction of wild dolphins, you have to leave early when the sun will rise. Why? Because the dolphins in this region appears only between the hours of 6 am to 8 am. At that hour, dozens of dolphins will show their activities.There are few that just swimming in the water, there are also few that skipping around. Simply speaking, awesome!. Usually the tourists had gathered on the beach at around 5:30 am to go to sea. You can hire a fishing boat that had been prepared for the journey. The journey begins with a small boat that could only carry a maximum of 4 people in addition to the fishermen. The boat will take you approximately one to two miles to the sea to where the dolphin would normally appear. During the trip, you can see a vast sea view and while the boat away from the mainland, you can see the mainland from a distance like a silhouette. Having reached the middle of the sea, the fishermen will be down to where the dolphin would normally appear. And if there is a group of dolphins that jump, the fishermen will notify other boats around it so that the boats will increase the speed to chase a group of dolphins. Of course you can record when the dolphins jumping in the ocean. But there are alsotourists who could not see the dolphins. 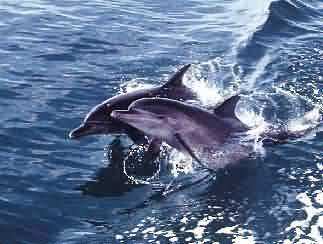 It depends on natural factors such as the pair of sea water, wind direction, and your luck to see dolphins in the wild. This “pursuit” will last approximately 3 hours. However, if you’re feeling sick because of seasickness you should not hesitate to tell the fishermen to return to the mainland. 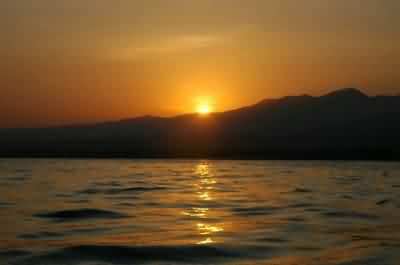 While traveling back to the mainland, you can enjoy the scenery along the coast of Lovina with the glimmering light of sunshine. You can also enjoy a tour at Lovina marine park. In the area of Lovina, you also can dive or snorkel to enjoy the beauty of the sea. You can find a variety of ornamental fish that are friendly enough to approach divers.Indeed, Lovina marine park is not as beautiful as other marine park in Indonesia like Wakatobi or Bunaken. However, you will be quite happy playing with ornamental fish in these waters. On the beach, you can find a variety of shells. You can take it to a collection of trinkets and souvenirs that is both natural and attractive. There are many affordable lodging in Lovina. There is also lodging that provide attractions of trained dolphins as well as a mini zoo in the inn. You can choose a variety of lodging accommodations from simple Inn to a cottage. From Denpasar to Lovina, you can pass Bedugul then to Singaraja and towards Lovina. You can also pass the route from Bedugul to Seririt and to Lovina. Both routes takes about 2 hours drive. Another route is from Gilimanuk directly to Lovina that can be reached in almost 4 hours. The line was relatively straight and comfortable although the journey takes longer. Lovina Beach can certainly be your destination. Many interesting things you can find in there like the performances of wild dolphins, as well as marine parks with a variety of ornamental fish. Especially if you’re visiting Singaraja area, spend some of your time to stop by stay at least one day in there to witness wild dolphin attraction in the early morning.